Have you noticed how BIG necklaces are for 2012. Big beads, thick collars, hand formed wire necklaces and collars. 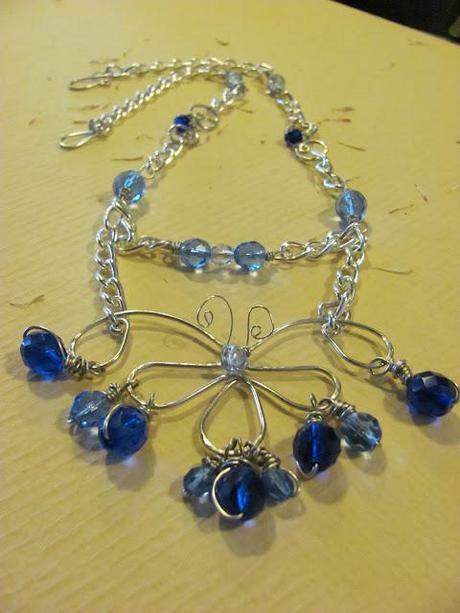 So handcrafted jewelry is the new in for fashion style when it comes to jewelry. Well we became a little inspired by it all and created a jewelry piece for HOPE. You do know that we created a jewelry line named JIJI CHIC Jewelry. We have named our creation "The Hope Butterfly in Junes Flight". The Hope Butterfly in Junes Flight is especially inspired for all those who struggle from having a loved one who suffers from illnesses like cancer, lupus, etc. My heart goes out to these wonderful families, the patience, the pain of watching a loved one suffer is awful. I know from experience; with my husband who suffers from Multiple Myeloma Bone Cancer. JIJI CHIC is my avenue to get away from the pain and focus on creating and inspiring with hope..